Loving these shots from the latest N.E.E.T. magazine; you read it online for free but watch out for the million vintage e-shop adverts! Excessive tumblring means viewing many, many shots of American candy and home baking, so I have sweets on the brain (but do I ever not?). FYI the food stash I brought over here has disappeared. I can only blame myself. Today I had the second photography class in the Textile Museum studio, where the class started two hours late!! I was there bright and early at 8.27 but the teacher didn't get there until after ten due to a mix up, and after we walked back and forth through the snow to the Textile school to find out what was up. After an hour I was mentally planning out the whole free day so was a bit gutted that the class went ahead but it was actually very cool! I handled a Nikon200 with the biggest paparazzi-style lens. The course ends in a week with an indoor photo shoot of our choice. Ooooh the possibilities! On Thursday we have to bring in some inspiration and I've got a truck load. I was thinking of doing something with the 30+ pairs of false lashes in my possession, or maybe cola can curls, blowing handfuls of glitter, or maybe taking advantage of the amazing youtube tutorials out there. Of course it will be cute, but less Lula, more POP. Not that I am thinking I will be a future photographer but it's more the styling that's exciting. I'm just planning on seeking a lot of guidance from the teacher and then taking multiple shots hoping to chance upon a decent one! I just listened to a BBC Radio One documentary on Burning Man and it's made that festival bug creep up again. Although I'd work at V again if I really had nothing else planned (as there's no point doing it for the money or music, just the experience of an out of the ordinary weekend), I don't think I'd be a camper this year. I'd rather arrive fresh and ready with a teeny bag for the day than wake up hungover in a suffocating tent with mysterious piercings (true story! ), and I know that the time spend on the campsite could be spent in an arena anyway! Seriously at the last Reading I went to I only saw about six bands! We spent the time lazing in our camp, but it was 30 degrees. Hmmm I don't know, every time I go I remind myself that camping doesn't have it's bonus points, but there's totally a voice saying 'wiiimpy diva' in my head haha. Once you pop you can't stop, I wish I'd saw Lady Gaga at V last summer. It's like the Erasmus programme I'm studying on, there's a voice in your head always saying 'do something new/exciting every single second! stop wasting time! you could sleep in England!'. The shoot above did inspire me to wear a slick of lilac lipstick, layered over No.17 'Pink Power'. It's from Lime Crime, the make up line of Doe Deere who I posted about last year. Check the shop link for the true colour, which is an icy lilac. I bought the colour on a whim similar to the hair post below; I just need tacky, clashing colours! And I can safely say it is an amazing lipstick, the opaque colour goes on in one coat. I got the purest lilac so that I could mix it with pinks like today to find a shade I fancied. And I'll explain the pigtails later, although Prada SS10 should justify them straight away! 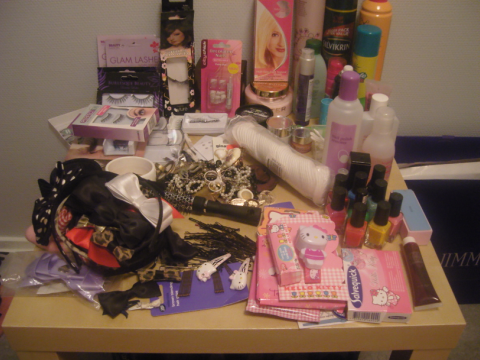 Aaaah can't decide whether to go shopping in Gothenburg tomorrow! To check out the end of the sales but is it too early for new season stuff? Ahhh this weekend needs to be over! I woke up yesterday and had a mad cleaning session which only ever means I'm hungover or stressed. Thankfully either happens at least once a month so I am usually dust free! But seriously there are a few things worrying me right now, topped off with dramarama and general insanity. I'm resisting throwing a few eggs at one of my flatmates' door and it's so confusing to know people so temporarily. And to top it off just as I was listening to music excessively loudly and speed eating jelly tots, a day doesn't go by without a random middle eastern student lurking your Facebook and saying they are the man of your dreams. Euuurgh you positioned my friend last week! When I lost the post below after writing it for two whole hours I nearly cried. But no when you are existing alone in the world you just have to hit yourself a bit and read some calming fmlifes. It's all starting to kick off here now as I had my first class on Thursday which is photography! I would never get to take a class like that at home though so I will try to blag it! It was interesting to learn about light sensitivity and shutter speeds but I think I've reached an age where my brain just doesn't hold information. It's like a leaky tap and I can sit and listen avidly to a lecture but forget everything in a matter of hours. After fifteen+ years of education, I might have reached the limit. My porous brain has absorbed as much information as it can! I'll have to try to get rid of some useless knowledge, such as Ed Westwick trivia. My new flatmates are all very cool, and the other new students I've met are lovely, especially the textiles girls! Last year felt quite cliquey after about a month but I made such good friends I don't think I can match it! There are some great new students though, like a boy from Hong Kong who studies fashion and in the night club I was like 'you're so fabulous!' and he was like 'darling, I know!!' hahaha! The new people on my floor are from Indonesia, Czech Republic, Taiwan, Austria, and then there are the Spanish guys from last year and my Chinese bestie Chichi of the Nutella and stirfry on toast fame. Oh and the Iranian guy we now don't need to talk to! There was another welcome dinner on Friday that I wasn't allowed to go to, but us old students crashed the after party and I watched in awe as about 100 people from all over the world jumped around to pop music in one big huddle. English people must have dancing barriers because here the exchange students always just go super crazy. I would blame it on alcohol but it's extortion! I also realised where all the Swedish people hang out when they're not in the one club. They go to McDonald's! Yes Chichi and I hit there after the afterparty for a midnight feast and it was rammed with young people generally flinging fries and acting rowdy in their super-sized duffel coats. On Thursday I spent the whole night looking for people, then going to the bar, then the toilets, then repeating that, so I don't even think I danced to one song! They have an English DJ up until around midnight who I tried to tempt into playing some Girls Aloud, but he sticks to terrible 90's RnB. I saw the Swedish guy I went on a few date things with last term and he invited me to his birthday party last night but by about 5o'clock I was ready to either kill myself with the aid of makeup brushes and felt tips or just end it quickly by jumping off the seventh floor balcony. So that's what has happened this week! Well only the things that have just came to mind, some nice and happy things did happen! One such thing is this hello kitty watch that I picked up while stockpiling chocolate in England. Something told me 'No Selina put down the watch filled with sweets', but out the packet it is amaaazing. Especially the secret compartment! It has a pink soft plastic polka dot strap too. altamira, studded hearts, the fashion critic, dirty little style whore, to love with studs, dirty little style whore, zoe claudia, little bambi boots, zoe claudia, fashion nation, dirty little style whore, the fashion critic, dirty little style whore, studded hearts, caillianne @ beckerman bite plate (a great blog, check it out! ), zoe claudia, dirty little style whore, dirty little style whore, zoe claudia, dollygumdrop - hope you appreciate the excessive sourcing!! you can click for the original sizes too. Tavi and I would be homegirls but I failed and she owned! Seriously! Her blue hair is the best. I think I have an new addiction to tumblrs. At first I thought they'd be annoying in a google reader, but it's actually great to have a cute picture pop up between written posts. Maybe I'll do a post on my favourites! I've saved a million pictures on my computer but a massive chunk are of pretty girls with coloured hair. Can you believe I posted about it way back in September, it only seems like yesterday! So I've officially been thinking about it for four months with no avail. The lilac streaks I bought are quite tricky, especially since the don't curl. In fact I don't know exactly where they've gone! Along with my favourite ever black lace H&M skirt, this room seems to be claiming things in an invisible black hole! Over Christmas I decided to take action and bought a cheapie spray-in colour, which just ended up just turning crispy. So I got some gel colour by StarGazer in the New Look sale of all places! And I picked up some bleach and brought it all the way over here as I knew I'd be bored last weekend while the flat was empty. So Tavi and I were simultaneously dying our hair! I should have ignored the instructions given as an hour of bleaching did absolutely nothing. And I did it twice! Actually it might have been best to ignore them first but obey them later when they said 'do not store as the bottle may explode'. A few days ago I found a big puddle of bleach on my floor, oops. I died the first two curls. No difference! Btw you know it's best to not wear precious clothes when dying so I wore one of my Dad's fire station tshirts that my sister and I always steal! The pink gel has a lid that ends in a comb and the gel squeezes through the middle, which makes it less crispy and more evenly toned. And you don't get pink hands! It still turned a strong pink without any bleach effects but it's too bright, not the pastel, faded pink I wanted. Maybe lilac would be better? It didn't last until the first wash though, it barely lasted one sleep! It just sort of disappeared over night? So this either means I'll have to go to a hairdresser and say hello, I'd like pink hair but I'm not crazy, or have perpetual one-coloured hair. And before you think it, yes I know I don't have brown or blonde hair so it's harder to find a colour that looks OK but I've saved way too many pretty pictures to not join the club too. Which colour do you think would be good? I think I might be going to Copenhagen Fashion Festival in a few weeks so that's the deadline! Maybe the ends could all be dip dyed? All this totally takes me back to teenage days of under18 rock clubs where under-colours and piercings were like the coolest thing. Ah and I might have some spare Copenhagen tickets with free London flights so start thinking if you can make it! 'A picture an hour' posts are among my favourites to see. Maybe it's delving into a more intimate life beyond words or maybe it's just curiosity! One of my all time favourite blogs The Clothes Horse has some fantastic APAH posts, and cult Swedish blog Niotillfem used to do them often too. You know I did an interview for The Clothes Horse not long ago where I planned my dream party! I'd assume you already read Rebecca's marvy blog but if you haven't already, you can read the post here! If you have a blog, why not consider posting about your day too? I always get the early flight and end up packing well into the night, this time no exception! 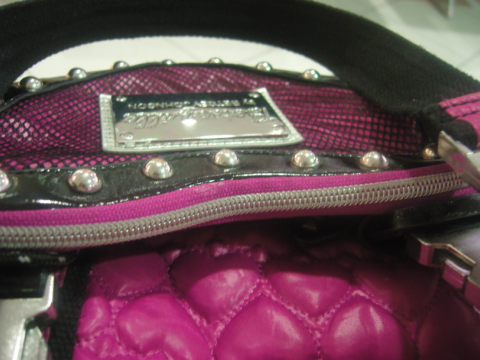 But I haven't travelled yet without the hot pink, heart quilted Betsey Johnson bag I got off eBay last year. It's the perfect size and so light (I'm looking at you Luella with your insanely heavy bags!!!). Snow boots? Hahaha I've never bought anything practical in my life! I brought over my Docs for snow trudging but they are way too heavy to pack as luggage, I need as much food allowance as possible! So I satisfyingly clomped through the airports. 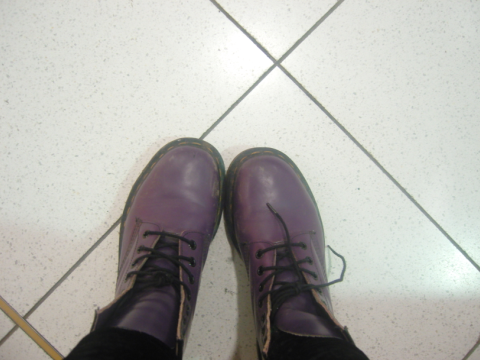 Wearing Docs make you feel like a moody teenager, especially if you wear them with (velvet) leggings like me and end up swinging your legs off chairs. I got these a few summers ago second hand and I've almost, almost worn them in. Another teeny plane! 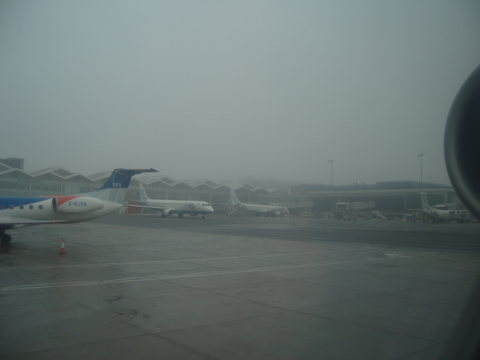 I was hoping to get a gorgeous view of England covered in snow but it was so foggy! Still so strange to be in the air in a tin can. I'd brought magazine supplies but just snuggled in my layers. I can tell the time! Before you ask, I lost an hour once landing in Copenhagen. 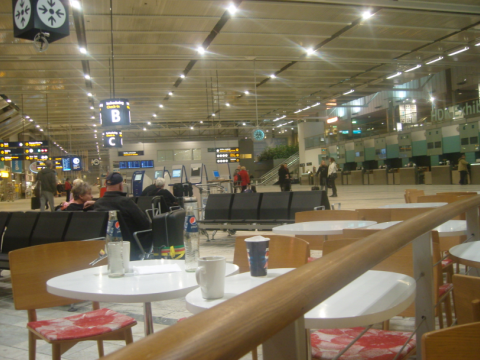 The airport is so posh and you have to walk twenty minutes to each terminal. I know because the signs said 'Gate B15 - 20 minute walk', boo! But they have loads of designer stores, it's more like a mall. 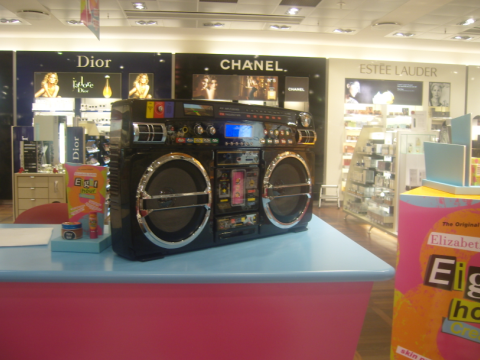 And the beauty counters had this crazy boom box which I snapped sneakily. 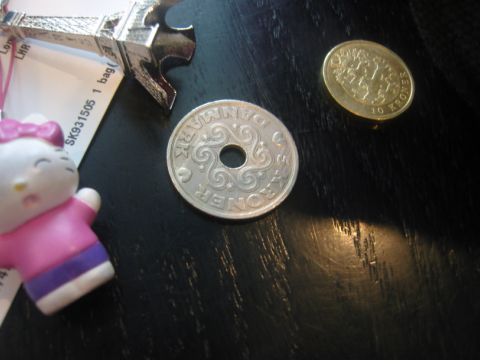 These Danish people have some crazy money! My first plane freebie! Well I did nab a pass to the BA business lounge once when I went on a blogging trip to Luxembourg ages ago, but I was still delighted with free water! 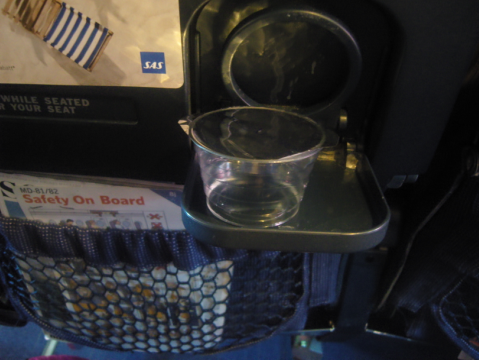 This shows the standards of the flights I take haha. Gothenburg Airport is great! Gothenburg City airport is a disaster- that's worth remembering if you fly Ryan Air. Thankfully I booked SAS, unthankfully the bus to Borås was a mere three hours away! I wish I'd known that before I dragged my cases into the snow to the stop, oops! I contemplated a luxurious taxi, then remembered I had no Swedish cash. The magazines came in very handy while wasting time. So much time! Although Cheryl makes things better. Ah bet you didn't know I bought this coat! 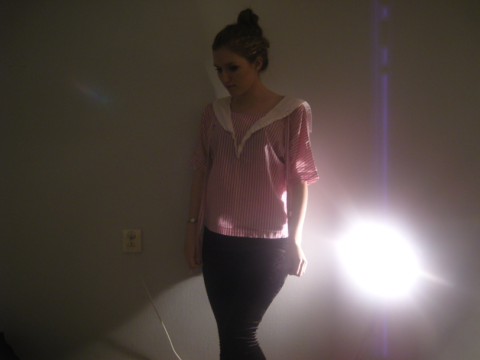 Do you remember it from a very early Sweden post in Gina Tricot? It was marked down in the sale and suddenly really appealed. On the airport bus finally! 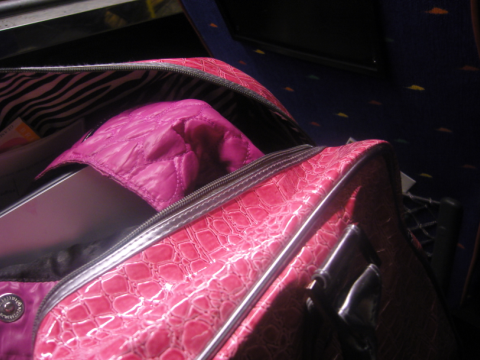 I didn't actually take just my Betseyville bag as hand luggage, I got this pink wheelie case in the New Look sale. I don't know how I ever lived without a wheelie case before! In fact today I took it to the supermarket and got so much food! It's a bit of a monsterous pattern and colour, even with a zebra print lining, but in a good way I feel. Eventually back!!! I changed some random Euros at the airport and took a taxi from the town bus station up to my halls in the apparent ghetto. 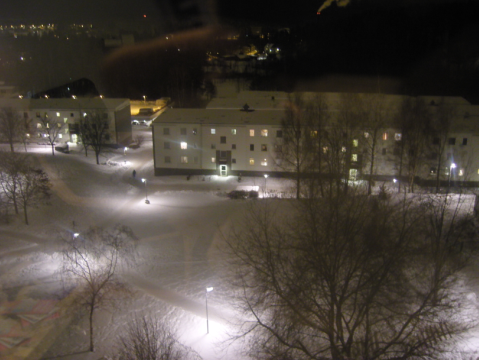 There is so much snow! The driver and I were talking about how England has had a melt down (ha ironic) because of the snow and the driver was like, 'In England don't you even change your tires in Winter?!' Umm no! This is meant to be ordered although somehow it doesn't look it in this photo! I only bought a few new pairs of false lashes at home but brought over more accessories. 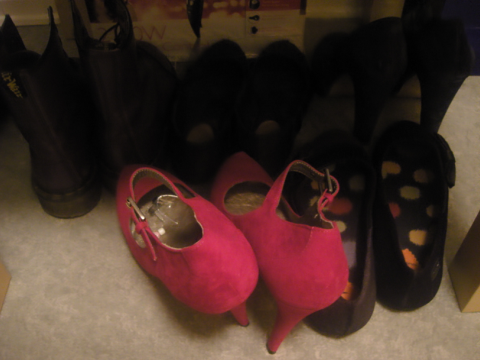 Hmmm five pairs of shoes. There's actually six but my knee high boots are not pictured. I can live with six pairs fine, I'm not really a shoe girl! I've totally lived in these velvet leggings all Winter. And Autumn. Since I got them! If you're contemplating some, they will be the best purchase ever. And you have to put your hair up if you're in Sweden. It's just the law. 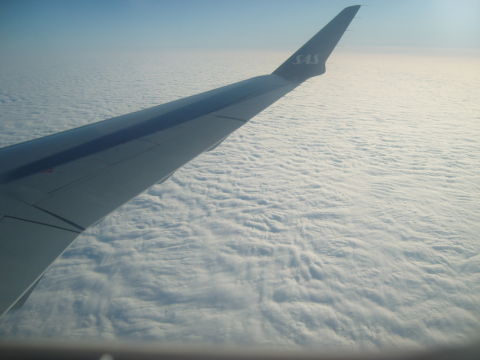 I'm blogging from Sweden again! I just got back on Thursday and it's already been jam packed with fun and frolics . Apparently you can't pay with cash on the buses anymore and an old man hugged me in the supermarket. I was actually in the said supermarket buying an array of carrots and yoghurt as my weekend budget stretches to the 80SEK I kept in my purse for novelty reasons. I stupidly forgot some card numbers and have no $$$ access until Monday, so I'm holed up inside my Hello Kitty drenched room with only my unwise purchase of carrots and a recovered tin of butter beans that I'm not quite sure how to cook. Never fear though, I do have the excessive amount of chocolate and sweets I brought with me! Half of it contains gelatine so I'll have to give them away but I have enough English chocolate to last at least a week. Possibly. I was sad to leave home after six weeks and say goodbye to all family and friends and a hot guy; it almost feels like after the school summer holidays where you're excited to go back but you know everything will change! There's a few new people already but I think we'll have to wait until the welcome party and a few flat parties before all the exchange students know each other. I only need to take one class this term though, so could potentially finish in about three months? Ah I need to sort my life out. Plans this term: go north, swim in the lake, visit Malmö and Copenhagen, visit friends in France (possibly during fashion week), bring friends to England. Most likely events of this term: spend tense hours waiting for English TV shows to be uploaded online, make Topshop/ASOS orders that will take three weeks to arrive (plus a mile long walk to the post office, aka through the 'ghetto', over the bridge, through the forest), buy an infinite amount of wrong things such as fruit syrup and rainbow milk, and fail at adopting any Swedish beauty, i.e. being tall and/or blonde. Speak soon chicklets! 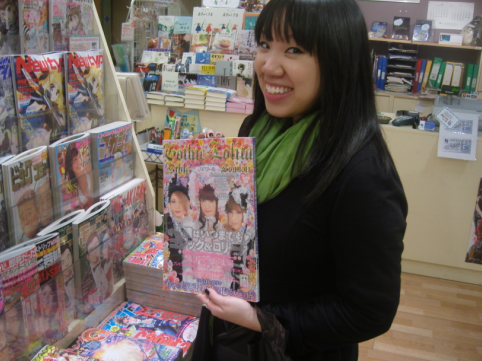 A couple of weeks ago I met up again with Winnie of Diamond Canopy and we went to London! 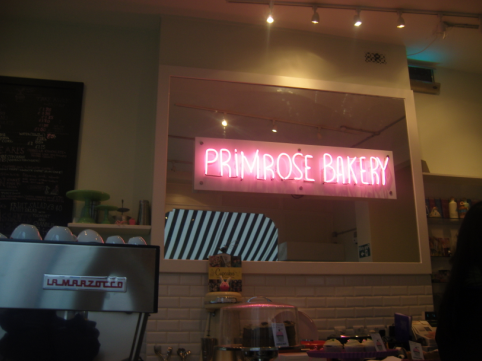 We went to the Primrose Bakery in Covent Garden and met Kristabel of I Want You To Know, who is gorgeous and is studying abroad in New York right now! It sounds unbelievable. We chatted all afternoon about everything to do with blogs over the cutest cupcakes ever. If our degrees don't work out, Winnie and I will definitely set up a cupcake bakery in Birmingham! 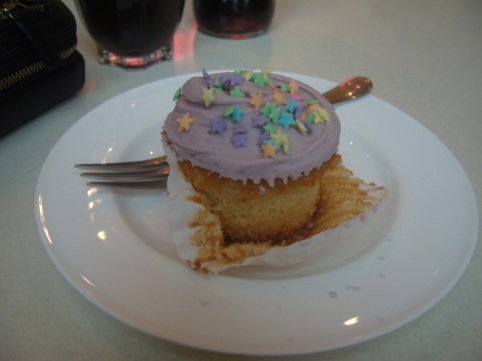 Eventually we left and went to Ella's Bakehouse for more cupcakes hehehe. I was very tempted to buy the edible glitter and have sparkly food forever more, but I left it to the experts and we went on to check out lots of vintage shops (one with a bizarre number of dead, stuffed animals!) and the new Anthropology store. After another cupcake stop, we ended up at Liberty where we met the fabulous Fiona, one half of Save Our Shoes. I lusted over the Shu Umera lashes and tested a bit too much of an insane lime perfume, and then we hit a really cool restaurant/bar called Vapiano where you put all your buys on a swipe card and pay on the way out, and they cook to order! There's a few photos of us in Kristabel's post here but as usual I was too busy chatting to get snappy happy, but it's a resolution to photo whore more! I did get a few snaps in the Japan Centre that Winnie and I popped in before the cupcake fest. 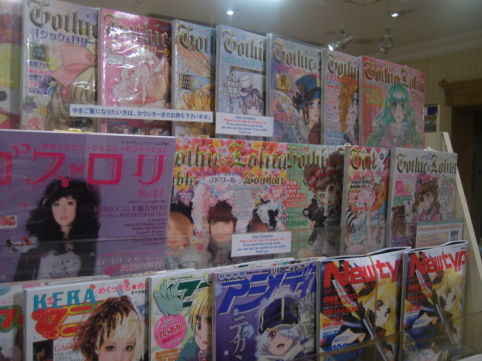 The Gothloli magazines were fab but very expensive so we just flicked through them, and then stumbled upon a reduced shelf full of random magazines and books. 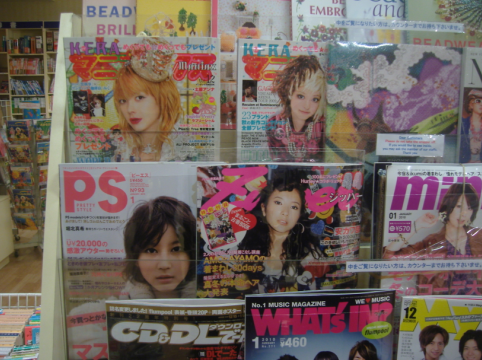 I spotted an old FRUiTS issue but picked up this mag called egg! It's quite hilarious and marvy all at the same time, even though I don't exactly understand it! 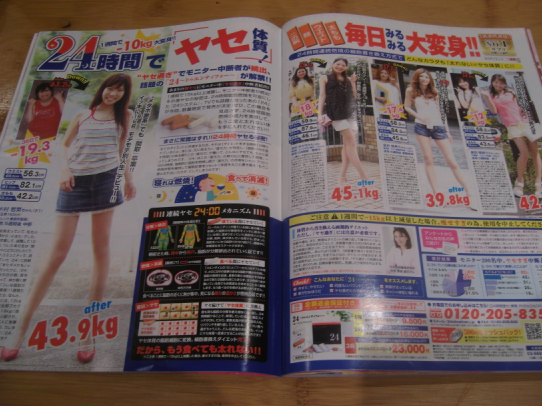 I think it's part catalogue, part diary, with four different styles represented by different girls. 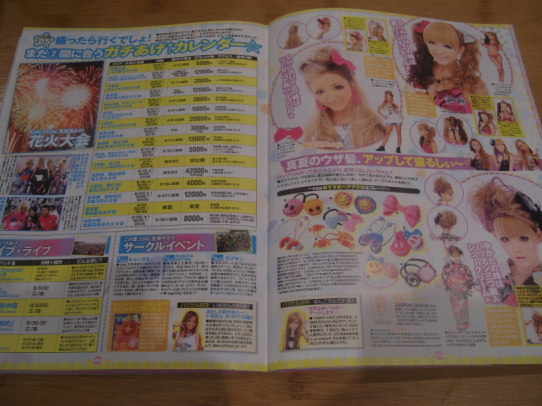 It's all sort of westernised, with fake tan and lashes and lots of blonde extensions. There's even adverts for coloured contacts, plastic surgery, diet pills, everything! Haha the boys are so orange too. 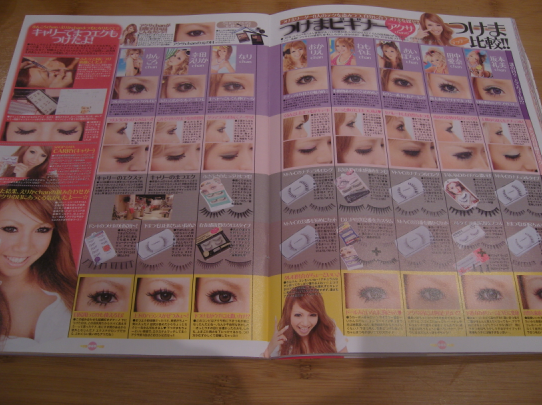 One section is for under-16s so I think it is a teenage magazine; I quite like all the fake lashes though!